WesternU students are expected to pursue opportunities to develop professional skillsthrough curricular and community-based activities. Community service experiences include opportunities to apply clinical, interpersonal, administrative, analytical, and leadership skills that foster learning and development through application in real world environments. As part of the informal curricula, the program allows Health Science students and faculty to: 1) learn through giving service; 2) participate as team members; 3) to demonstrate humanism, caring and compassion in the HPE and CHE professions; and, 4) conduct action and community-based research. Ongoing service opportunities are brought to the attention of MSHS Faculty. Please contact your Department Chair for current activities. 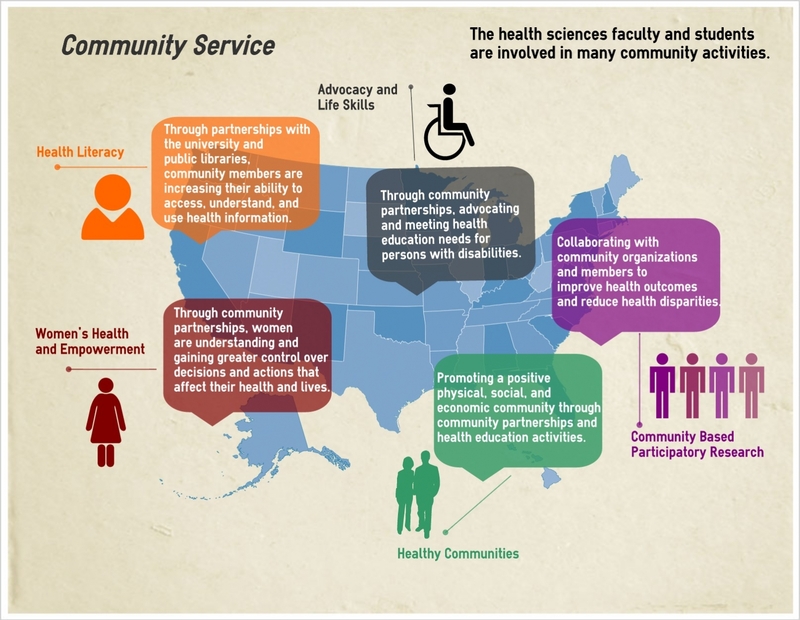 The Department of Health Sciences is promoting a positive physical, social, and economic community through community partnerships and health education activities. Through partnerships with the university and public libraries, community members are increasing their ability to access, understand, and use health information. Through community partnerships, MSHS is advocating and meeting health education needs for persons with disabilities. Through community partnerships, women are understanding and gaining greater control over decisions and actions that affect their health and lives. MSHS is collaborating with community organizations and members to improve health outcomes and reduce health disparities.